One of the hidden treasures in Utah is located just off of 1-15. 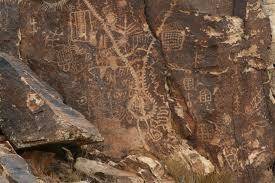 The Parowan Gap (about 25 miles north of Cedar City) holds one of the most extensive collections of Native American petroglyphs. This amazing site holds dozens of pictures including an impressive calendar map, animals, trees, and numerous shapes. This area is held sacred by many Native tribes including the Paiutes, who are believed to be descendants of the people who created this rock art. The gap itself, a narrow passage between two large rock formations, is a rare geologic wonder and natural observatory adding to the spiritual mystique. To see this art in its original location is nothing short of spectacular. Believed to be at least a thousand years old and likely much older, this place is a very rare glimpse into ancient America. This unplanned detour took us an hour (including taking multiple pictures and reading the signs and brochure). It was my husband's favorite part of our trip (often the best parts are surprises) and the kids enjoyed guessing what the pictures depicted (like a diving board). Quite an amazing place.